Ambassador Duong Chi Dung, head of Vietnam’s Permanent Mission to the United Nations (UN), World Trade Organization (WTO) and other international organizations in Geneva, has been elected Chairman of the World Intellectual Property Organization (WIPO) General Assembly for 2018-2019. The election was made by representatives of all 191 WIPO member countries at the WIPO General Assembly’s 49th session in Geneva on October 2. Ambassador Dung was the candidate from the Asia-Pacific region, which has not had any representatives serve as Chairperson of the WIPO General Assembly for 12 years. He said his election with the support of all 191 member countries showed their trust in Vietnam. It was also the result of contributions by the Vietnamese mission in Geneva and himself to the WIPO’s activities. He lauded the Vietnamese mission’s strong electioneering and solidarity among ASEAN and Asian-Pacific nations which advocated Vietnam’s candidacy. 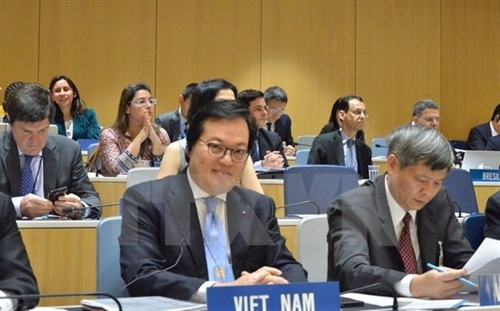 The country’s election as the Chair of the WIPO General Assembly demonstrates Vietnam’s multilateral foreign policy and its stature as a responsible member with practical contributions to building policies and regulations at multilateral organizations, he said. The WIPO General Assembly, founded in 1967, is one of the 16 specialized agencies of the UN.